Glengoyne is in the Highlands (barely): the line dividing the Highlands from the Lowlands apparently runs in front of the distillery and the whisky is matured in warehouses in the Lowlands. This is, however, deeply uninteresting so let’s let it lie. Glengoyne prides itself on using only unpeated barley and are also noted for extensive use of ex-sherry casks for maturation. I’ve not had very many Glengoynes and the only one I’ve really liked a lot is the now discontinued (of course) Glengoyne 12 CS. 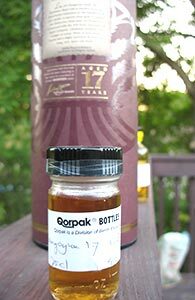 I acquired a sample of this 17 yo in a swap. I tasted the first ounce soon after receiving it and liked it well enough to pick up a bottle while it was still deeply discounted in California. I decided to drink the second ounce now and review it as I plan to open the bottle soon and it seemed like a good idea to commit myself to notes on the sample and then see how the freshly opened bottle compares.